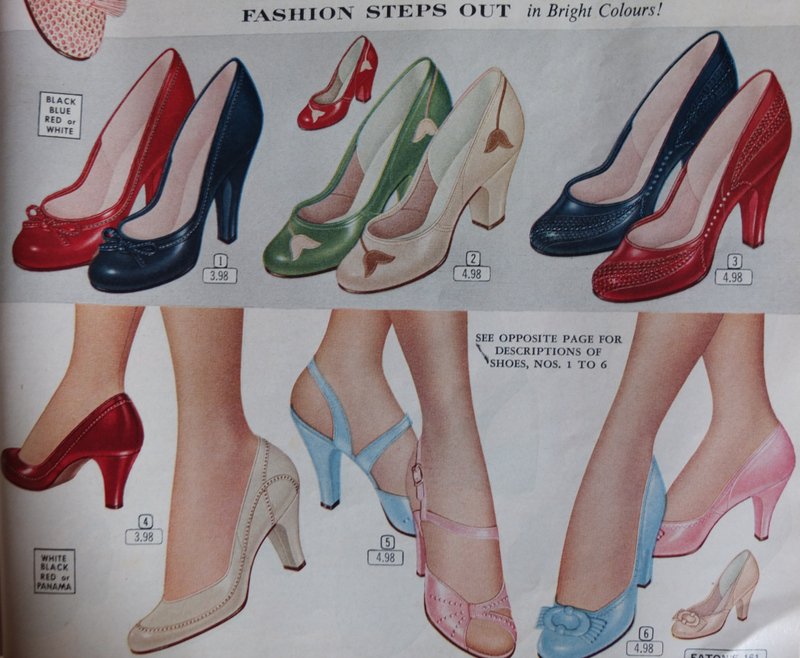 Oh, for the Love of…1950s Shoes! | Oh, for the Love of Vintage! One of my favourite things about Spring/Summer is the need (or want) to purchase new shoes. 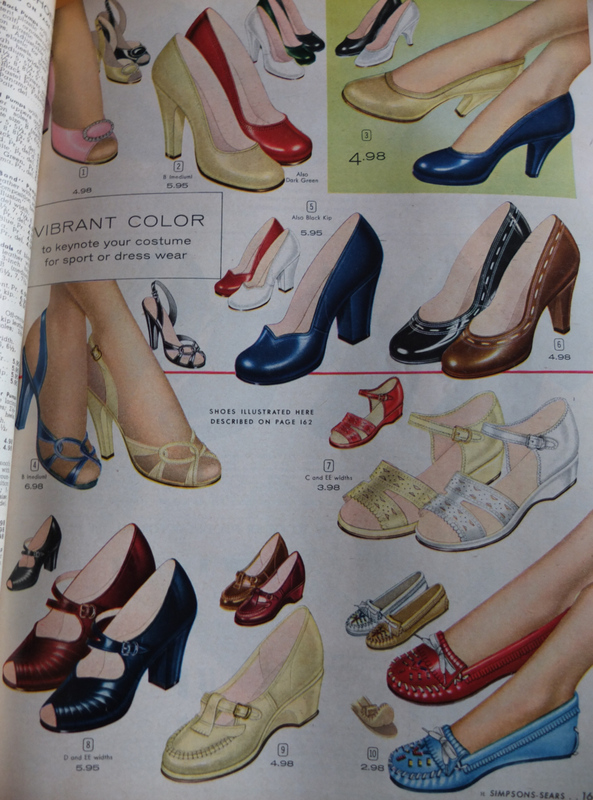 I need, yes need, some new shoes to match all my new 1950s dresses I recently purchased. My feet are definitely calling out to be adorned by some lovely shoes! 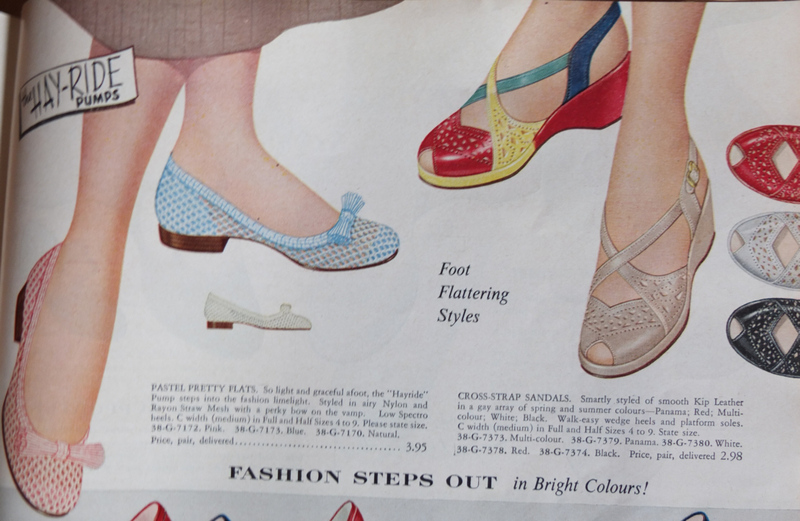 My last blog post featured Spring/Summer frocks from 1956 and now we’re going to have a look at shoes from that season. It truly was a good year for shoes. Such a variety of styles, colours and materials. 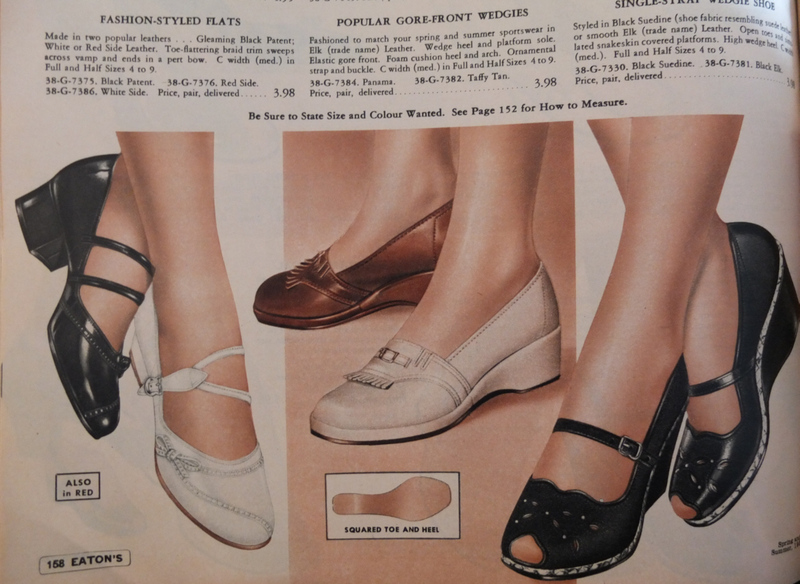 I just love the baby-toe pumps, wedge sandals, mary-janes and saddle shoes! 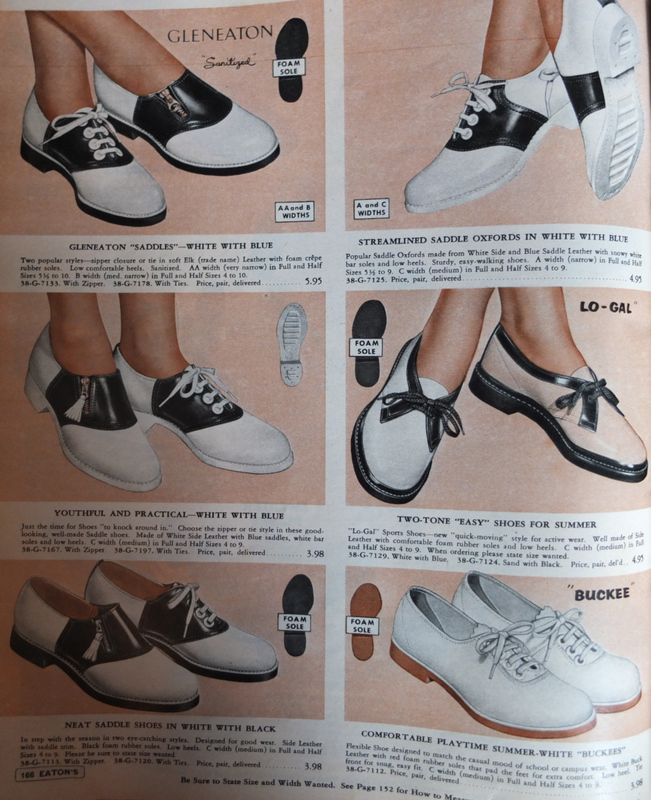 I wish these shoes were still being made. 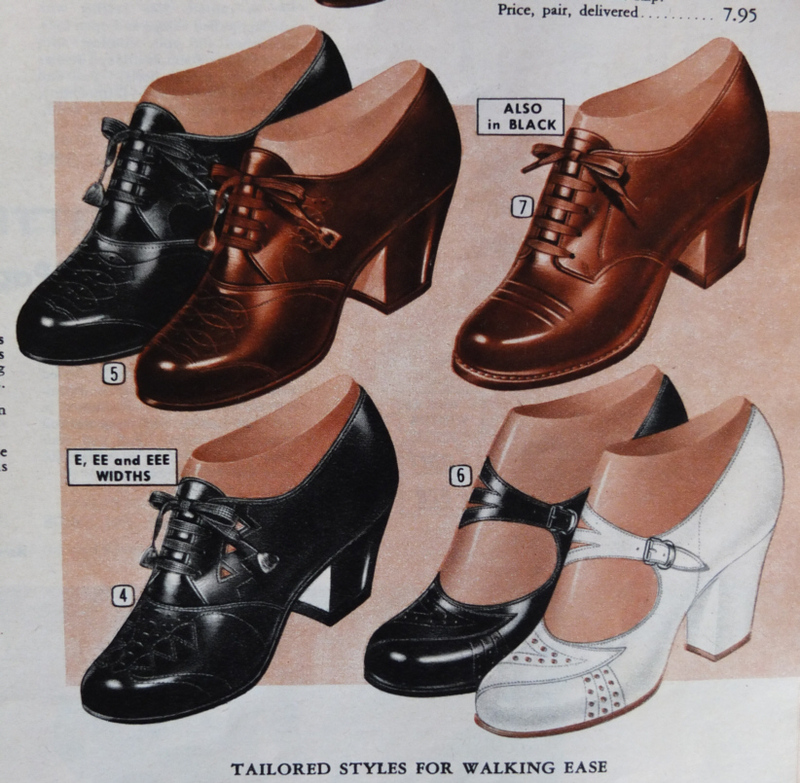 Yes, a vintage lady can purchase Remix Vintage or Ol’Woogies shoes, but they are expensive and not readily available. 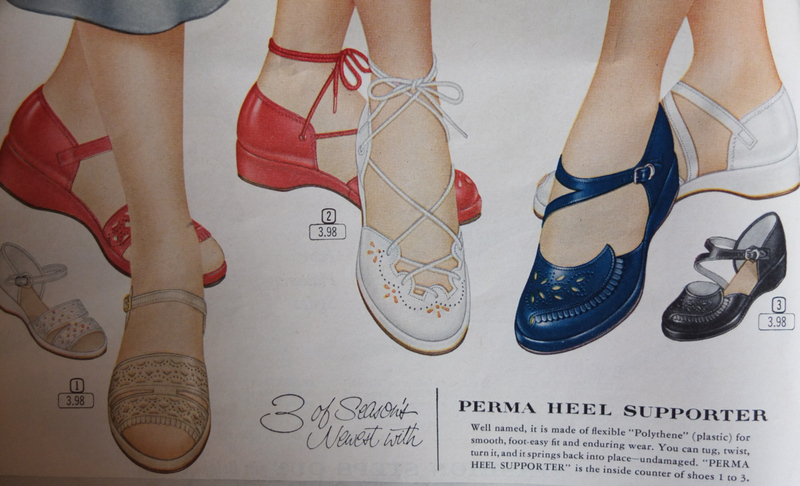 I have one pair of Remix Vintage shoes, Kiltie, and sadly they do not work with my feet. I’m going to put them up for sale online shortly. If anyone is interested in purchasing them, they are size 9 and have only been worn twice. 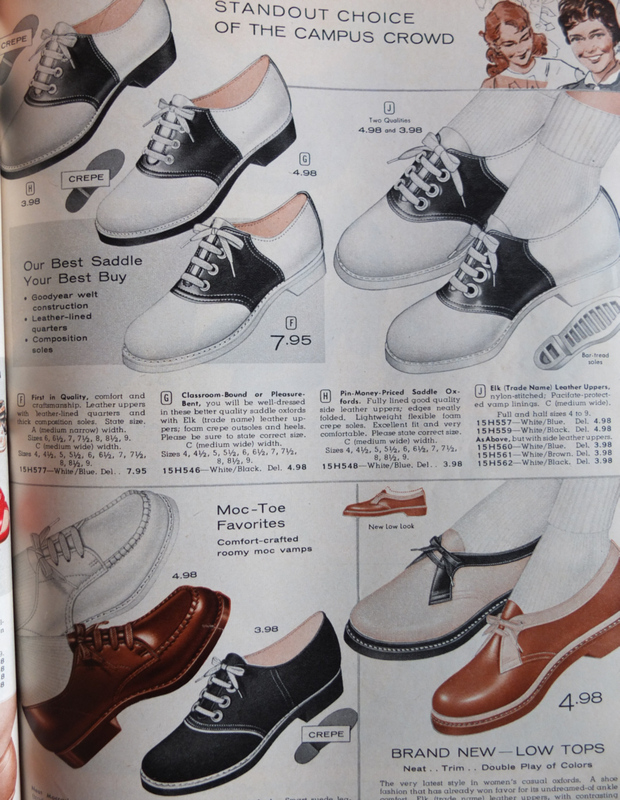 Let’s pretend we can order from the below catalogs. What top two pairs would you purchase? Ha. Thanks for the fun! Beautiful! 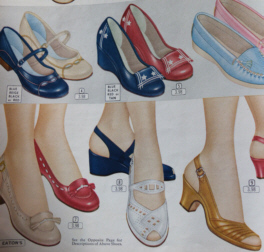 I recently discovered the website modcloth (dot) com and have been ooing and ahing over all the midcentury styles. I wish I could buy them all! 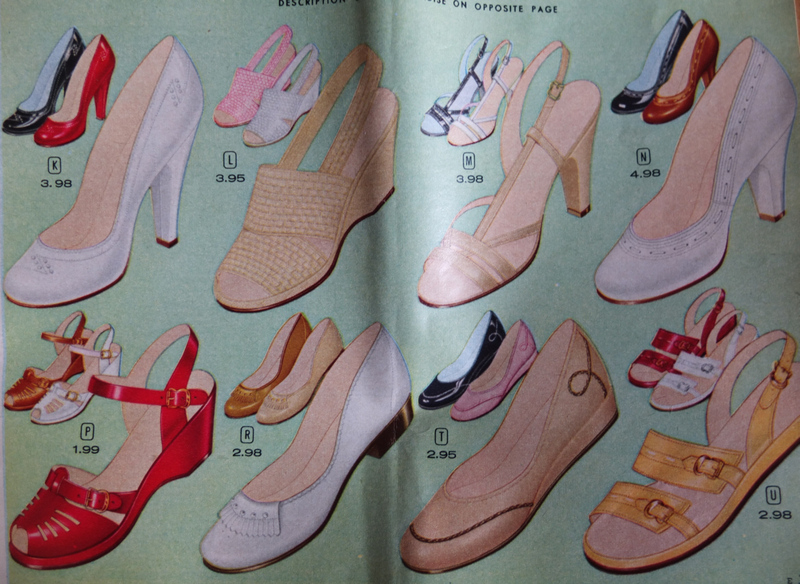 I really like the navy blue heels on the third page in the top left corner and the beige ones on the 12th page on the left. Midcenturyfella, I’m so glad she liked the post! 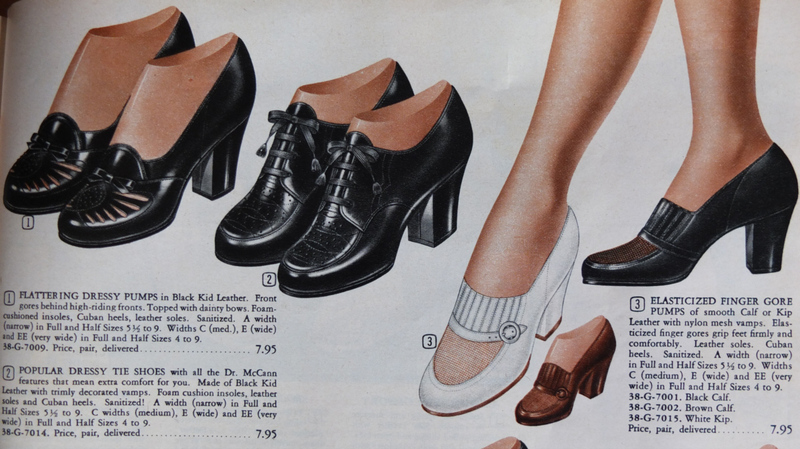 I wish we could all order from these vintage catalogs. The stuff is amazing! 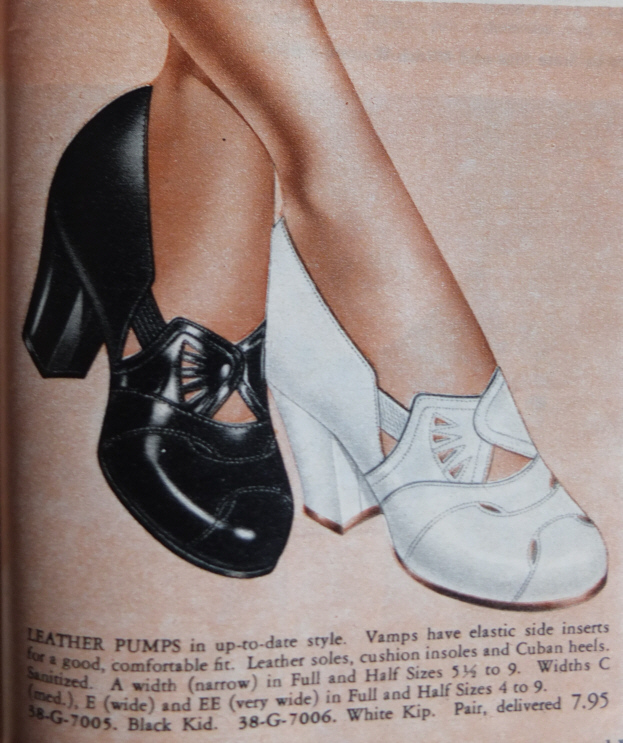 itsallourvault, I too love the shoes on modcloth. They have some really great styles. I’ve never ordered anything from them though as I’m cautious of buying shoes online. The two pairs I would pick, changes on the day! ha ha. 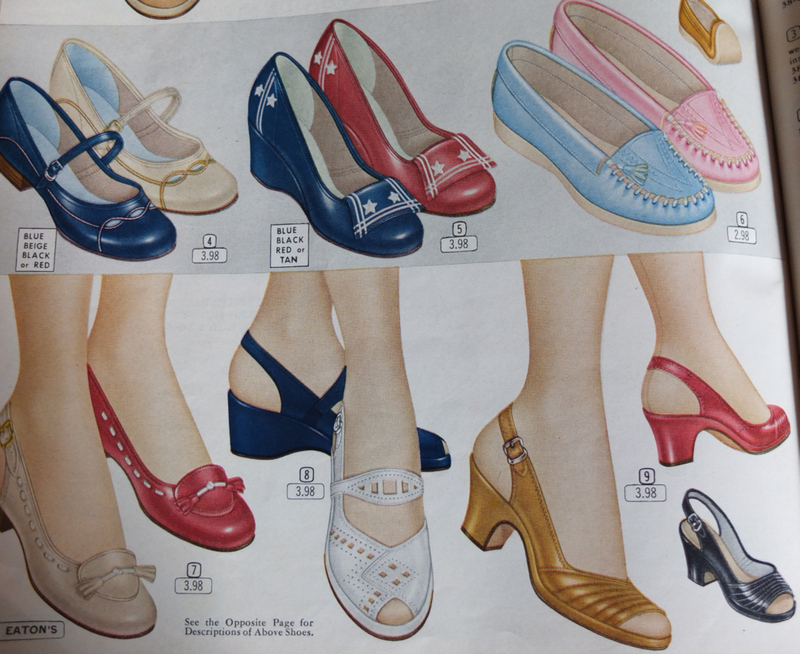 But, I like the rainbow sandals (in the fourth photo) and the blue and red wedges with the stars (in the 8th photo). Tomorrow, no doubt I’ll want something different! I love the colors that remix has, but they tend to be a little pricey for replicas. 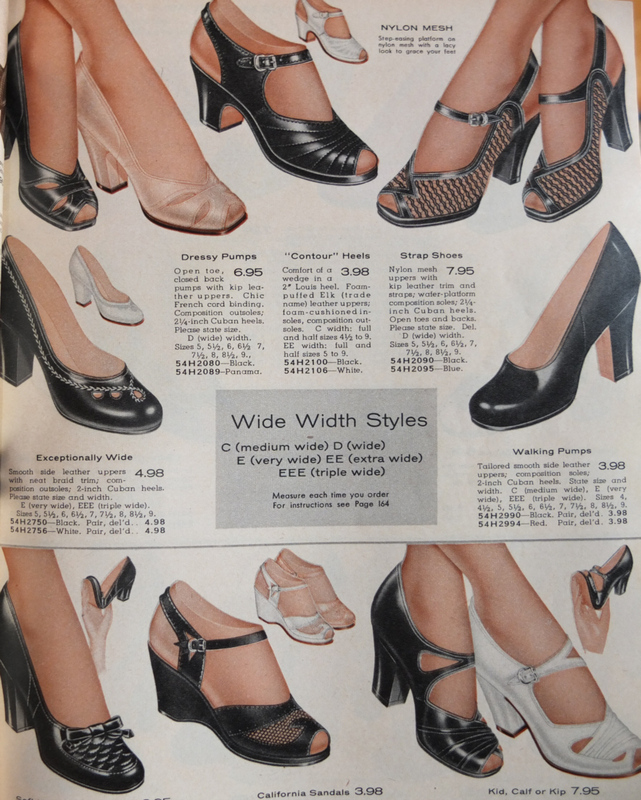 I found some really comfy shoes with aris-allens. 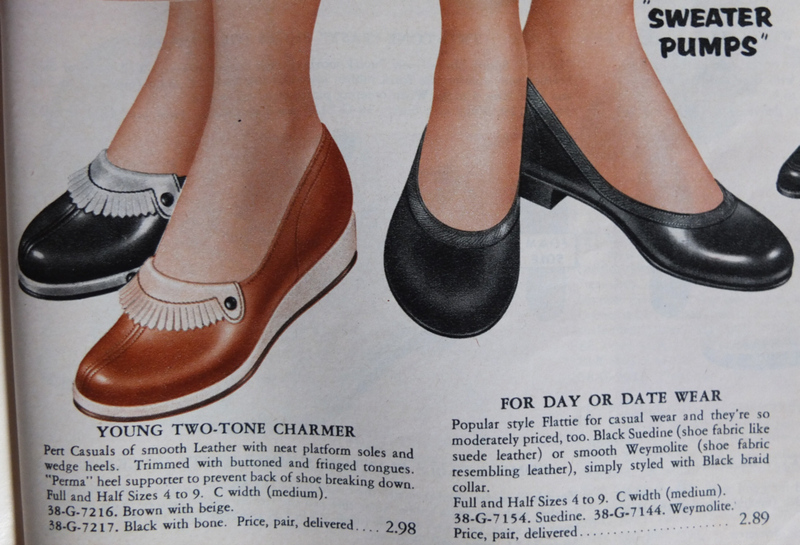 They have my favorite pair of 50s replicas that are just so comfy. I swear by oxford styles always because they are super comfy. 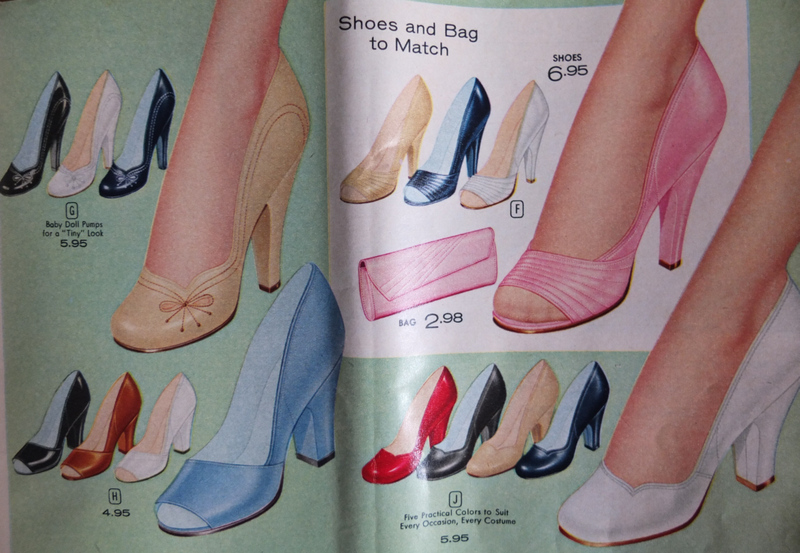 My two picks would have to be the blue ones on the third page (love the “Fashion steps out in bright colors” headline) and the baby doll pumps – in camel, with the awesome sort of atomic embroidered bow. But I love so many of these it’s hard to choose!